“There are more than 96,000 procurement and supply professionals in the UK alone, according to CIPS estimates. For the ambitious among this large group, there exist only a handful of strategic CPO roles to compete for. So what helps someone get there? Is there a secret sauce of competencies, skills and behaviours that the best of the best have in common? It’s something SM set out to explore in a first-of-its-kind study to assess the psychometric make-up of forward-thinking procurement leaders. http://greatpeopleinside.com/wp-content/uploads/2017/10/Great-CPO.jpg 562 910 great people inside http://greatpeopleinside.com/wp-content/uploads/2016/04/logo-GPI_02.png great people inside2017-10-31 15:15:342017-10-31 15:22:08What Makes a Great CPO? We are really proud and honoured to be featured in the ‘Executive Recruiting for Dummies‘ as one of the best assessment and development solutions for recruitment. For Dummies is the world’s bestselling reference brand. Each and every day, Dummies products are in the news, on bestseller lists, and, most important, helping customers turn “I can’t” into “I can.” This book offers great insight on how to find and hire the best candidates that “fit” into their company and for the job. You can also discover how to keep engagement soaring high long after the post-hire “honeymoon period”. Executive Recruiting for Dummies is exactly what you expect from this type of book. It is easy to read and understand and it is written by industry giants: David Perry and Mark J. Haluska. They have a success rate of 99.54% in their endeavours to find the best candidates for the companies that asked for their services. If you feel this book is for you we recommend you buy it before March 20th. If you do, you will be entitled to exclusive professional bonuses which include never seen before content from: Amy Karam (The China Factor), Steve O’Hanlon (The Digital Bank Revolution for Dummies), Ron Wiens (Building Organisations that Leap Tall Buildings), Timothy Keiningham (The Wallet Allocation Rule) and last but not least Dan Hill (Emotionomics). On top of that, you also get the chance to try out for free the best software tools for recruiting offered by Great People Inside. For purchases or more information on the bonuses, please visit this page. 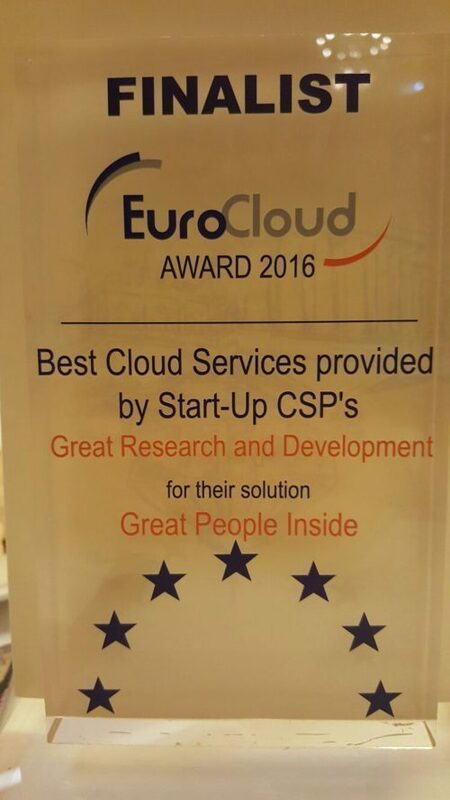 Great People Inside was among the 3 finalists for Best Cloud Start-up Service at the EuroCloud Congress 2016. We are deeply honoured to have made the finals among the top international Cloud providers. We are also proud that, during this past year, Great People Inside has evolved from a local start-up developed in Bucharest to an international company based in Singapore, having representative offices in Europe, Asia and North America. EuroCloud is an independent non-profit organisation and consists of a two-tier setup where every European country can apply to participate in as long as they respect the EuroCloud Statutes. The Mission of EuroCloud EuropeEuroCloud Europe is a pan-European cloud innovation hub, a completely vendor neutral knowledge sharing network between Cloud Computing Customers and Providers, Start-ups and Research centres. EuroCloud builds strong Relationships with local governments and the European Commission and supports a stimulating environment for the development and growth of Cloud Computing. EuroCloud sees Cloud Computing as one of the most important drivers of a knowledge based society, where physical resources are optimised and shared resources are common. http://greatpeopleinside.com/wp-content/uploads/2016/10/WhatsApp-Image-2016-10-06-at-09.59.16-1.jpeg 653 812 great people inside http://greatpeopleinside.com/wp-content/uploads/2016/04/logo-GPI_02.png great people inside2016-10-07 14:47:312017-02-15 15:52:35Great People Inside - Finalists at EuroCloud Congress 2016 for "Best Cloud Start-up Service"